UK: VBMS (formerly VSMC) has been contracted by RWE Innogy to install inter-array cables at the 336MW Galloper offshore project, with JDR Cables sub-contracted to supply the cables. UK firm JDR will manufacture 56 cables in 2016 for the site, located 27 kilometres off England's east coast. It is expected the project will use 6MW turbines. Dutch firm VBMS has been awarded the £100 million (€137 million) by RWE ahead of the German developer's final investment decision. RWE said VBMS plans to open a second UK office in order to satisfy workload. 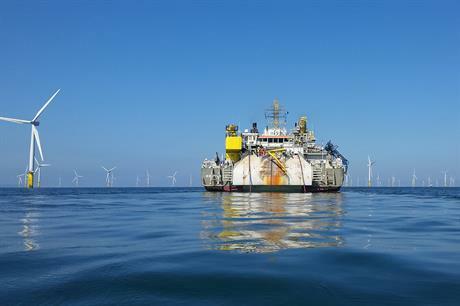 VBMS won a contract to install export cables at E.on's 400MW Rampion project, last month. JDR Cables was also contracted to supply Rampion's inter array cables. RWE reaffirmed its plans to begin construction on the project before the end of the year, just 12 months after it had shelved the project. In October 2014, the German utility cited tight timescales to secure financing within the outgoing renewables obligation (RO) subsidy and decided against proceeding with the project. However, in December 2014, RWE said it would revive the project under the contracts for difference (CfD) scheme being brought in by the UK government to replace the RO system. The project missed out on winning CfD support at the February auction, but RWE instead decided to continue along the RO pathway. Conditions around the grace period of the outgoing RO scheme mean the first turbine at the project must be generating power by March 2018. Galloper is an extension of the 500MW Greater Gabbard project completed in 2012.